Cathay Pacific Chief Executive Mr Rupert Hogg (2nd Right) and Director Customer Mr Simon Large (2nd Left) present the 2017 Change for Good donation to UNICEF HK Chairman Ms Judy Chen (Centre). The Cathay Pacific Group and the Hong Kong Committee for UNICEF (UNICEF HK) announced that a total of HK$11.7 million (CAD$2 million*) was raised from the Change for Good inflight fundraising programme in 2017. Since its launch in 1991, the programme has successfully converted spare change from Cathay Pacific passengers into supplies and services to improve the lives of vulnerable children worldwide. Of the total donation in 2017, Cathay Pacific has designated HK$2.73 million (CAD$470,000*) to support UNICEF’s Schools for Asia programme in Myanmar and India. The thematic programme, which aligns with one of the airline’s key community engagement endeavours of promoting youth development, aims to provide quality and sustainable learning for children. There is a particular focus on disadvantaged children who are less likely to receive education because of their gender, ethnicity, disability, geographic location or economic circumstance. This year, 24 Cathay Pacific employees, accompanied by UNICEF HK staff, conducted two field trips to mainland China and Nepal to learn about UNICEF’s programmes concerning early childhood education, non-formal education and child protection. In Guizhou province, the Cathay Pacific volunteer team witnessed how the Schools for Asia donation is being used to promote improved conditions and facilities to nurture a child-friendly school environment for the healthy development of children. The donation has definitely made a positive difference to both students and their parents. While in Nepal, the volunteers learnt how UNICEF’s alternative education programme is giving a second chance for out-of-school and marginalised adolescent girls who cannot afford to continue their education. The programme has greatly empowered these young women, especially in highly conservative communities. The remaining 2017 donation will be dedicated to UNICEF’s regular programmes to make long-term development plans for children around the world, enhancing the strategic outcomes of health, education, child protection, nutrition, social inclusion, water, sanitation and hygiene, as well as HIV/AIDS protection. The donation will also allow UNICEF to respond immediately to deliver life-saving supplies to emergency appeals and humanitarian crises. 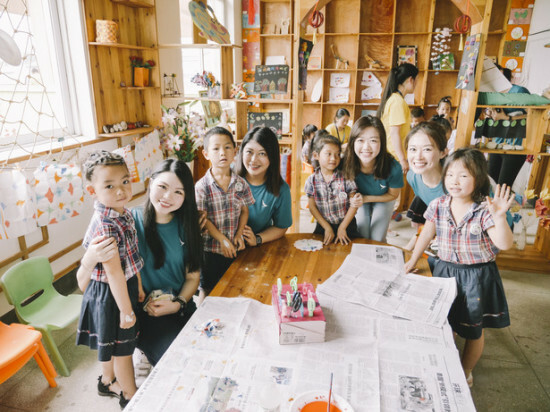 Cathay Pacific employees visited a child-friendly kindergarten in Guizhou, China in June 2018. During the visit in Nepal in September 2018, Cathay Pacific employees observed a class of adolescent girls attending lesson.